Inspired by the British Carden-Loyd, the Renault UE was mass-produced during the thirties. At the end of production, it was as one of the most produced tanks in western Europe and the French production record before the Cold War AMX-13. 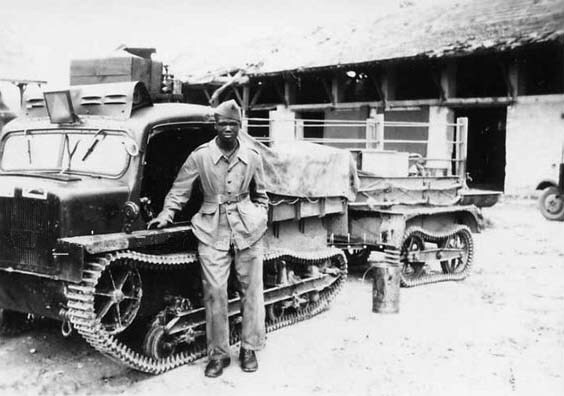 It was basically a low cost, unarmed vehicle, the French equivalent of the “Universal Carrier“, a versatile solution to carry guns and ammunition on the battlefield, and to perform scouting missions for the infantry. After the French capitulation in June 1940, nearly three thousand fell into German hands. They then had a second career throughout World War Two, soldiering on many battlegrounds, from France to Italy, the Balkans and Russia, and converted in many configurations, some surprising. Since 1922, the army was poised to equip the infantry with armored transports as much as possible. In 1930, the Commission de Vincennes had to choose such a vehicle among several projects. One of these was from the Brandt company, which already provided the French infantry with mortars. Seeking a way to carry these mortars quickly to the front, they sought a solution on the other side of the Channel. Vickers-Armstrong was demonstrating its Mark VI tankette precisely in this way. Brandt quickly devised a small mortar carrying trailer to be towed by such a vehicle, hoping that the commission would purchase Carden-Loyd models made under licence by his company. On 7, October, 1930, the commission rejected all proposals except for the Brandt one. 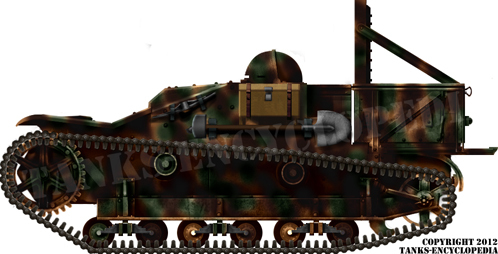 The type N, a small “chenillette” (tankette), also ordered from Renault and Citröen (which proposed vehicles using its famous Kégresse tracks system). The latter had all six prototypes ready by the summer of 1931. After trials all were rejected. 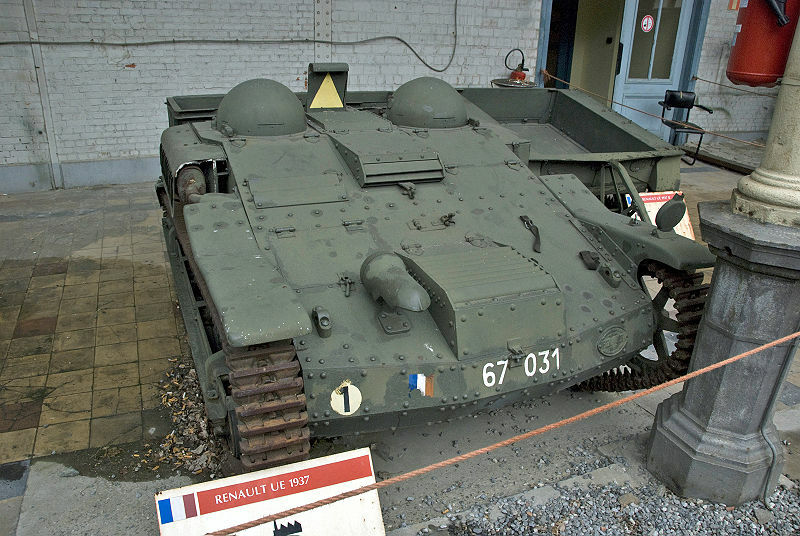 However, the half-track design was later modified and finally produced as the AMR Citroën Kégresse P28. Brandt was also ordered to build six prototypes for configuration trials. The trailer was delegated to the Latil company, which in turn was strongly inspired by the British Vickers trailer design. The final prototype, demonstrated in August 1931 to the Commission, had a strong resemblance to the British Universal Carrier design. Renault also presented six prototypes, the last one being equipped with double track guidance system, very similar to the Vickers system. Its UE model (a meaningless chronological denomination) which resembled a tank chassis without a turret, was assorted with its UK trailer. These were thoroughly tested in April-May 1930. Eventually, the Conseil Consultatif de l’Armement (which succeed to the Commission of Vincennes), under pressure to find a solution for the infantry, chose Renault as main contractor for the Type N in October. In December 1931 a first batch of fifty was ordered, named “Chenillette de ravitaillement d’Infanterie Modèle 1931”. 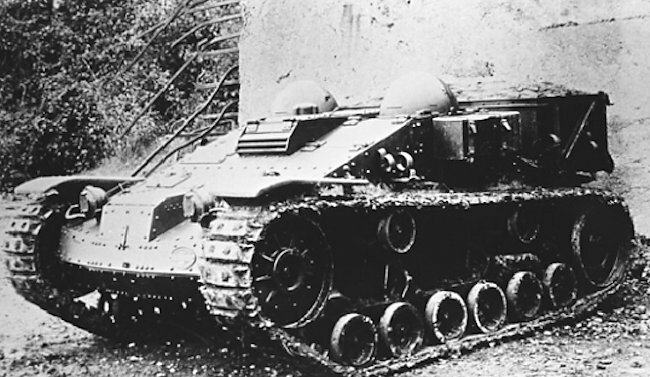 The Renault UE was very low, with the bottom at only 103 mm (4.06 in) from the ground. 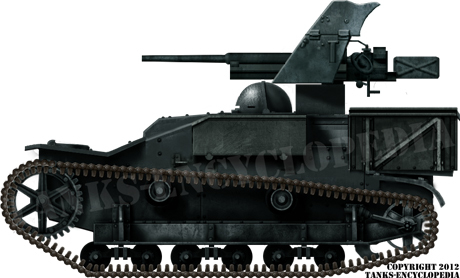 It was initially conceived to later receive various armaments and a fully rotating turret, both for further orders and export. The front part of the hull was steeply sloped and ended in a flat section comprising two crew hatches surmounted by small rotating cupolas. Once closed, small rotating vision slits guaranteed peripheral vision. 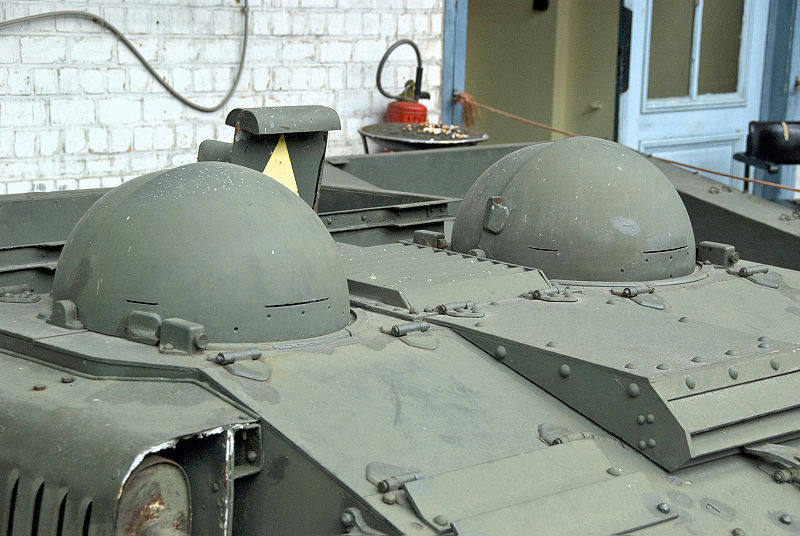 These hemispherical armored hoods (calottes) protected the heads of the crew and the hood could be pivoted backwards on the rear section when no immediate danger was present. The rear part of the hull was cut to make room for a large storage bin (145x65x36 cm/4.75×2.13×1.18 ft), for a 350 kg payload. The bin could be tilted for easier unloading. 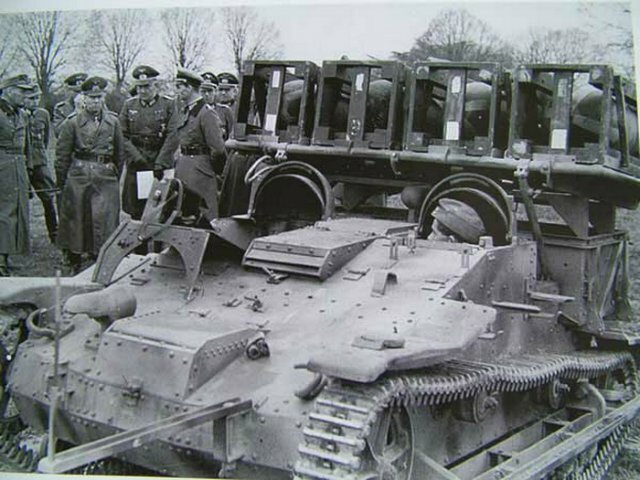 But the main payload (600 kg) was transported by a towed tracked trailer, model UK, close to the British type. The four-cylinder 38 hp Renault engine was placed in the center, between the crew. A ventilation intake and the removable engine hatch were protruding forward from of the hull and the exhaust was on the left. The transmission, differential and six-speed forward and two reverse gearbox were placed at the front. These parts were accessible through a second front protruding hatch. The driver sat on the left and the commander to the right. In order to communicate, instead of an internal radio set, a unique device was created. A small signal panel was mounted between the hoods, showing a pattern of continuous or flickering lights of four colors, forming a potential combination of 8 signals triggered by the commander for the driver. The UE was unarmed. There was no project to do so before the late thirties, with perspective of exports and with the threat of German rearmament. The Direction de l’Infanterie always resisted any attempts in this way, which would have diverted the UEs from their vital tactical supply assignation. However, the UE, with its flimsy armor, could only hold against small shell fragments and rifle bullets. 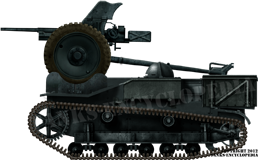 The suspension system was also inspired by British tankettes, with narrow (18 cm/7 in), 131 short links tracks and a three bogie system sprung by small leaf springs, each with a pair of small rubberized road wheels. The early guidance bar was dropped in favor of two return rollers. The maximum speed of 36 km/h (22 mph) was attainable only on road. But it was limited in practice to 30 km/h (19 mph) and rarely exceeded 12 km/h (7.5 mph) off-road with a full payload. Range was limited to the usual supply lines in trench warfare context. Renault UE2 (modèle 1937) Chenillette with its UK trailer, in the standard configuration of 1935. By a decision taken on September, 10, 1932, each infantry division had its own independent supply company (Compagnie hors rang), equipped with six UEs Chenillettes, and a Compagnie Régimentaire d’Engins, comprising three vehicles for heavy weapons support. The first model was universally known simply as the “UE”. But the official nomenclature called it the “modèle 1931”. 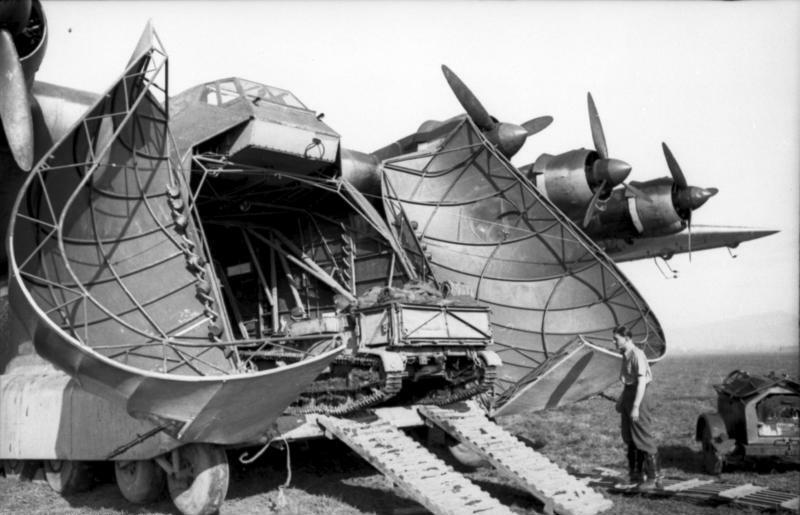 By 1935, the new threat formed by German rearmament advocated for a new modernization program. As far as infantry was concerned, new divisions would have been formed and new supply units had to be equipped, not to mention material obsolescence of the first run of the production. This triggered specifications for a new, enlarged and enhanced supply tank in 1936. This was promptly answered by no less than five companies, including the former bidder, Renault, but also Fouga, Berliet, Lorraine and Hotchkiss. These were tested by the reborn Commission de Vincennes from April to November 1937. The Lorraine prototype, formerly approved, ended in a longer version, the Lorraine 37L. The Hotchkiss model, although capable of carrying far more, was too slow, had weak suspension and was rejected, as was the Fouga model. Finally, the Berliet Chenillette, higher and bigger than the UE, seemed poised to win the competition, but, at the last moment, the Army rejected it in favor of Renault’s improved model, the UE2. Largely based on the previous one, this had the full advantage of not further delaying mass production, as little retooling was needed. This final choice was largely motivated by the speed and scale of production of the new vehicle. It was also the fruit of years of paper improvements, lobbying to obtain the formal approval of a new modernized tractor (called UE2), with mechanical features changed through official requests of the Commission de Vincennes. At the end, the Renault model almost perfectly matched the army requirements and was logically chosen. It seemed superficially unchanged. 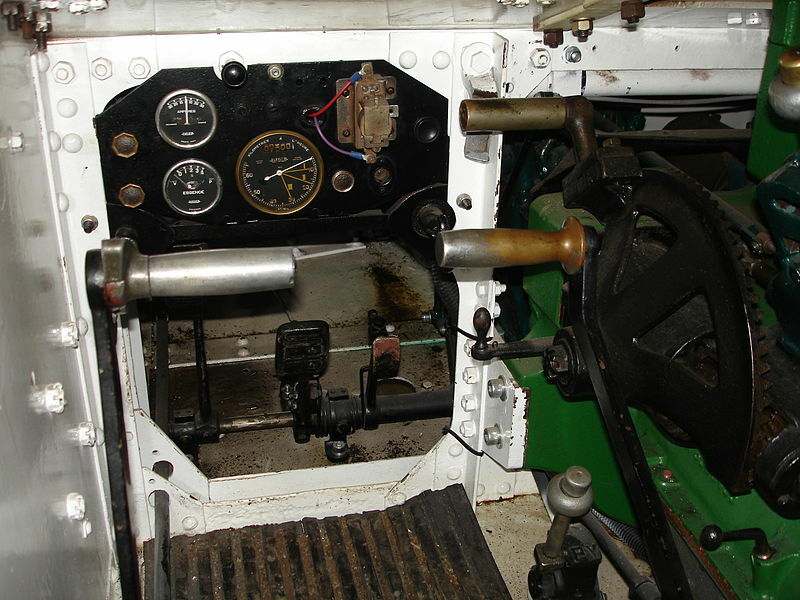 The hull, tracks, suspension and bin were identical, but the engine was modified with reinforced pistons, a new, sturdier differential was introduced and 4+1 reverse speed gearbox. The bin was now articulated with a semi-automatic locking/unlocking system, a rear night light and an armored Guichard headlight were added. The only external change were the front mudguards extended well higher along the glacis. 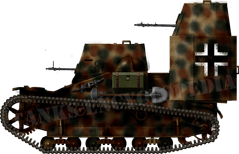 An order was placed for the Chenillette de ravitaillement d’Infanterie Modèle 1937 R in December 1937 to AMX, the new specialized military branch of Renault. Additional orders were also placed to Berliet and Fouga for additional UE2s in 1938. A total of 2848 UEs of both models had been delivered by September 1939. But the French rearmament only reached its full swing month later. To obtain a monthly delivery rate of 300 vehicles, Renault gratified AMX with a second assembly facility at Pontlieu. By April 1940, a total of 1650 more had been delivered, with production rate culminating in June. The total production of both types was 4977, of which ovet 4557 had been delivered to active units. In May 1940, almost all infantry division, at least at home, were assisted by supply units with UEs. But they soon found themselves almost completely useless as supply vehicles in this new kind of warfare. Some were used as makeshift scouts for tank divisions, with good results. These UEs remained unarmed, although some attempts were made as early as 1932, answering a request from the cavalry corps for a light armed scout version. 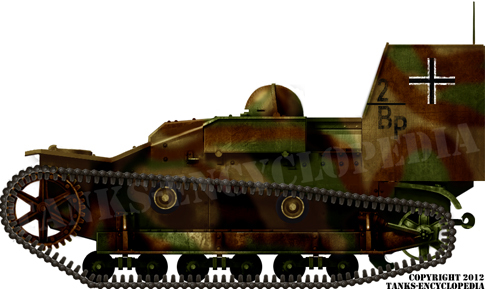 These developments turned into the AMR 33 tankette in 1933. In March 1936, ten UEs armed with MAC machine guns, housed by a low superstructure over the commander side, were ordered by China. They were delivered in 1938, but only to be intercepted en route by French Indochinese authorities, under Japanese pressure. They eventually reached China during the fall of 1940. 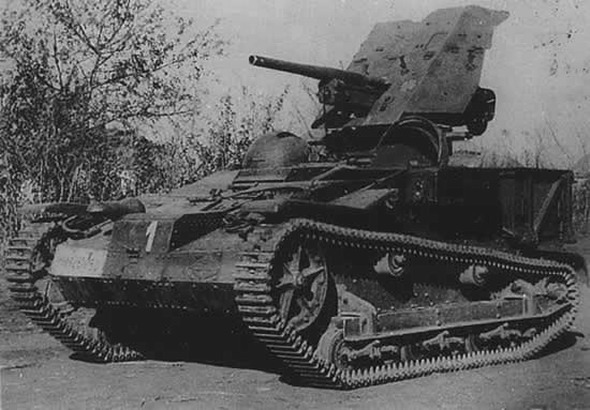 However, in May 1940, Renault was ordered by the Direction de l’Infanterie to build a new prototype based on the Chinese vehicles, and placed an order for 200 modifications, featuring an external “Reibel” mount for a 7.7 mm (0.3 in) MAC. How many were modified until June remains a mystery. Renault had some knowledge of previous Polish successes with their antitank versions. They modified and successfully tried a modified UE armed with a 25 mm (0.98 in) Hotchkiss heavy machine-gun, using armor-piercing bullets, on the 31st of May. By early June, 150 were ordered, but none were delivered or converted. In operation, each infantry regiment received nine tankettes for supply, and three in antitank brigades, the Compagnie Divisionnaire Antichar (CDAC). Each division totaled 30 UE Chenillettes. In Mechanised Infantry Divisions, this was however quite higher, with each CDAC totaling 12 tankettes, and mortar Compagnies d’Accompagnement two each, for a total of 66 for each of these motorized infantry divisions. Total organic strength was 2500 Renault UEs, with 1278 in reserve, the new UE2 gradually replacing the 1931 model. Escaping Polish units, which arrived in France, were also equipped with UEs, including the Polish 1st and 2nd Grenadier infantry divisions and the Polish Independent Highland Brigade, which was supposed to be engaged in Finland or Norway. Some even reached the United Kingdom. By late 1940, the Perth Reconnaissance Battalion and Polish 3/16th Tank Brigade were trained on UEs. As most of the infantry units were surrounded and captured by May 1940, these tankettes were nearly all captured, emerging from the operations almost unscathed. Alongside the British Universal Carriers left at Dunkirk and depot units in perfect order, the Germans took an unexpected lot of utilitarian tracked vehicles. 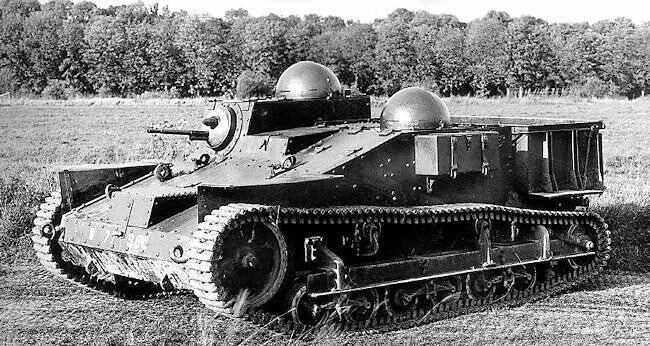 About 3000 Renault UE tankettes were captured before and after France surrendered. Most were marked with the Balkan cross over their original colors or receiving the regular Dunkelgrau pattern. They received minor modifications by AMX, now under German control and MAN supervision. 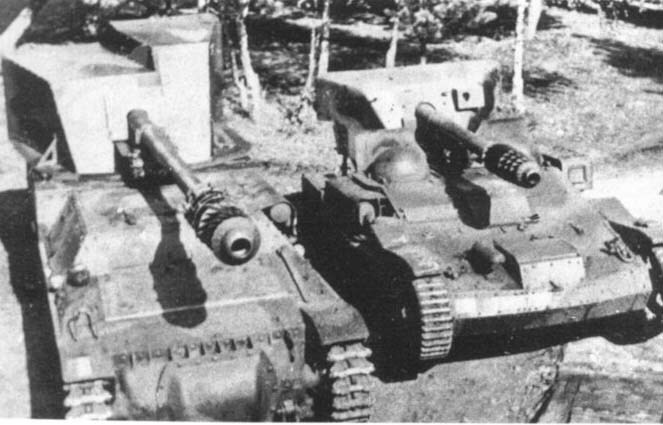 These included adapted external mounts for the MG 34 machine gun, in order to improve their suitability and use on the battlefield with infantry units, and reinforced towing apparatus to be used as tractors for much bigger guns, notably the 50 and 75 mm (1.97/2.95 in) models, and later the Russian 76.2 mm (3 in) AT gun. The bulk of the UEs served as supply tanks and tractors like the original tankettes, under the Waffenamt denomination Infanterie UE-Schlepper 630(f) and Munitionsschlepper Renault UE(f). The latter had an armored roof over the bin. 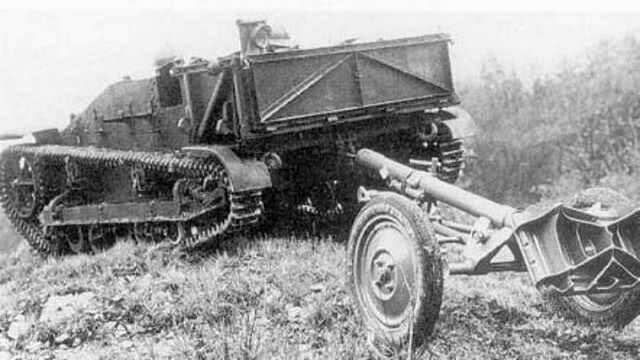 The usual antitank companies equipped with Renault UEs were towing tractors for the 37 mm (1.46 in) PaK 36 standard antitank gun. But soon, two versions of self-propelled artillery were developed. These were the Selbstfahrlafette für 3.7 cm Pak36 auf Renault UE(f), totaling 700 conversions, which were slightly modified versions, fitted with a bucket-style platform at the front, to hold the PaK 36‘s wheels. The crew operated around, completely unprotected. If the gun was disabled, a second one could be installed quickly. 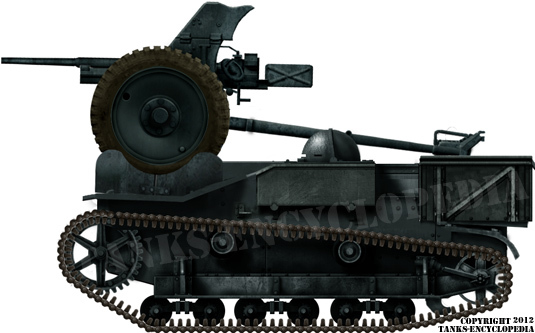 The second model was a more radical one, with a fixed PaK 36, on a special mount located just behind the crew cupolas, on the center. This mount comprised only the gun and its mask. The ammunition was stored in the bin. The crew also operated almost completely unprotected. The bulk of these tank-hunters were part of operation Barbarossa in July 1941. Other modifications included the Mannschaftstransportwagen Renault UE(f), a personal carrier, the Schneeschleuder auf Renault UE(f) and Schneefräser auf Renault UE(f), both snowplow versions designed for the rigorous Russian winter (introduced late 1942), the Fernmeldekabel-Kraftwagen Renault UE(f), a telephone cable-layer and the Panzerkampfwagen-Attrappe auf UE(f), a dummy tank used for training, fitted with a plywood superstructure resembling the Russian T-34. Armed versions were also widely used, comprising the Gepanzerte-MG-Träger Renault UE(f), used for liaison and scouting, and the tall and impressive Sicherungsfahrzeug UE(f), a vehicle specially crafted for the Luftwaffe, to guard the provisional airfields on the front, against partisans and Resistants night raids. 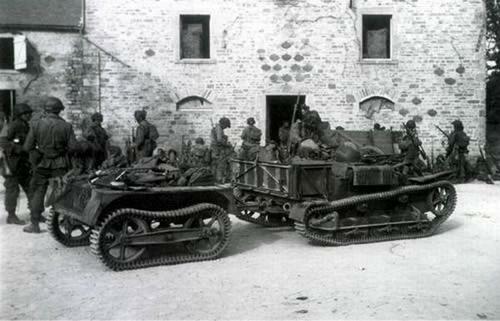 Also, by the fall 1943, these vehicles were deployed to support infantry actions with rockets. 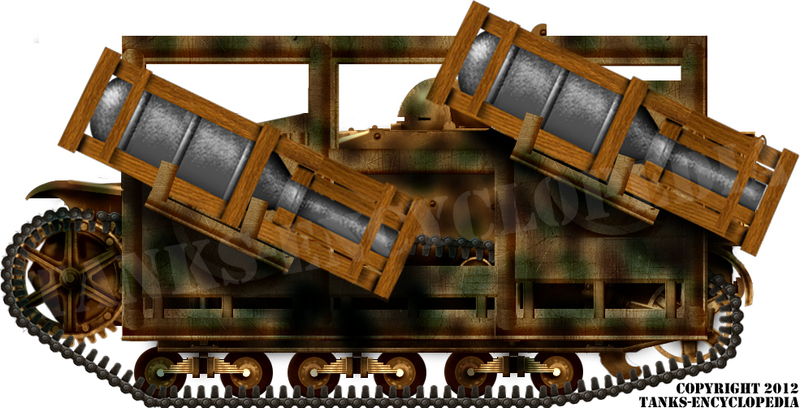 The Selbstfahrlafette für 28/32 cm Wurfrahmen auf Infanterie-Schlepper UE(f) (40 units) was equipped with eight makeshift side launchers, or a bank mounted on the rear, instead of the bin. Another one was the unarmed Beobachtungspanzer auf Infanterie-Schlepper UE(f), fitted with a tall superstructure, replacing the bin, as light command and radio vehicle. Most of these were active during D-Day, in June 1944. Most UEs were deployed in the Balkans in April-May 1941 and afterwards served during the Russian campaign. They were also deployed in Italy, but most were stationed in France, near the AMX facilities for spare parts. Some UEs survived the western front, and around 18-20 are still extant today, including many in running conditions. In German service, the UE was appreciated for its sturdiness, reliability and low profile, which compensated for the lack of protection. It also became popular because, even in late 1940, many artillery units of the Wehrmacht were still horse-drawn . Before the war, Romania was one of the few French allies in Europe. An order was placed for ten UEs and a licence was acquired in 1937. These tankettes had to be assembled by Bucharest-based Malaxa company, with AMX parts. 300 were ordered, but finally only 126 left the factory when the deliveries stopped from France in May 1940. The Şeniletă Malaxa Tipul UE was turned for the profit of the Axis when Romania shifted sides. 50 more of these UEs were then supplied by the Germans. They were deployed with Romanian forces joining the Russian campaign, notably in Crimea, as anti-tank companies towing the 47 mm (1.85 in) Schneider Modèle 1936 AT gun, and supply tractors for the Motorized Cavalry Regiments. By 1943, surviving ones were phased out and kept for training or as modified tractors, capable of towing the heavy 50 mm (1.97 in) L/60 German field gun. Although there are very few remaining pictures of these vehicles, 64 UE Chenillettes were transferred by the Germans to their Italian allies. They were kept unmodified as towing tractors for AT companies and ammunition carriers. There are no records of their use outside Italy or the Balkans. None seem to have seen service with the German Afrika Korps or the Ariete division. Most of these tankettes were based in Sicily and were encountered during operation Husky, in 1943. Many were captured and served with US Army infantry units afterwards. Regular UE tankette, early type, unknown infantry unit, “Provence”. Normal paint was a dull bronze green. UE modèle 1931, early supply tankette, “La Rodeuse” (Grinder), unknown infantry unit, northern front, May 1940. Captured by German troops. Renault UE2, late production (modèle 1937). This vehicle was painted with a three-tone camouflage (from a June 1940 photo), a rare occurrence, as supply tanks were uniformly factory-painted dull bronze green. Additional colors seem to have been added afterwards. Şeniletă Malaxa tipul UE, a licence built Romanian supply tankette. 126 were built, of over 400 ordered, at the Malaxa factory in Bucharest. Production started in late 1939 and stopped in March 1941, when AMX stopped sending supply parts. They were based on the UE2 design and fought with the Axis in antitank companies. 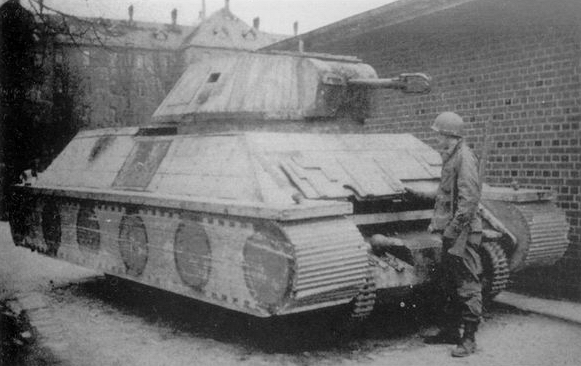 Renault UE1, armed prototype for the Chinese order (March 1936). A small boxy superstructure held a small ballmount machine gun model 1936 MAC 7.7 mm (0.3 in). A previous prototype, built in the fall of 1932, was rejected by the cavalry. 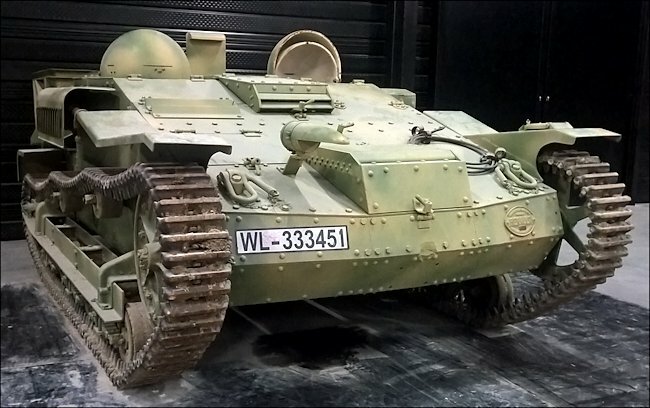 Ultimately, the Chinese order motivated emergency production of derived models, as well as 200 modified tankettes with a small fixation for an external Hotchkiss machine gun. It is unknown how many of the MAC-Reibel type were delivered prior to June 1940. Ten armed UE (with a 7.7 mm/0.3 in MAC) were built and all were confiscated while en route for delivery by the Vichy French Indochinese authorities, under Japanese pressure. Apparently delivered in the fall of 1940. Gepanzerte-MG-Träger Renault UE(f), early version, Yugoslavia, April 1941. UE-Schlepper 630(f), Greece, April 1941. This configuration was the mainstay of all versions used by the Wehrmacht, in the very same duty. In practice, they towed the standard-issue PaK 36, but also the 50 mm (1.97 in) PaK 38, 75 mm (2.95 in) PaK 39/40/41 and 76.2 mm (3 in) PaK 36(r) anti-tank guns. UE-Schlepper 630(f), towing a standard-issue PaK 36 infantry gun, mostly used by antitank detachments (Panzerjägerabt). Ammunition was housed by the large storage case behind the crew compartment. Selbstfahrlafette für 3.7 cm Pak36 auf Renault UE(f), early conversion, with the gun just held in place by a dedicated framework. 700 vehicles built. Most were sent on the Russian front, few survived until 1944. Their thin armor was an issue. PaK 36. This prolific gun, the infamous “door-knocker”, was still efficient against most of the Russian tanks, like the BT series or T-26. 125th Panzerjägerabt, attached to the 125th Infantry Division, Russia, March 1942. Mannschaftstransportwagen Renault UE(f), an infantry transport conversion. The bin was converted as a two men bench, while two other could sit on the large front mudguards and glacis. Unknown unit, Crimea, August 1942. 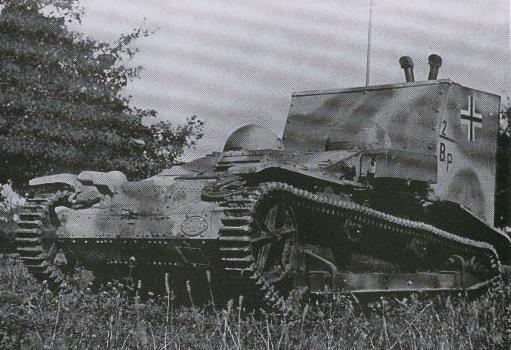 Gepanzerte MG Träger Renault UE(f) of a Luftwaffe Unit, converted version with a MG 34 machine gun and bigger gunner compartment. 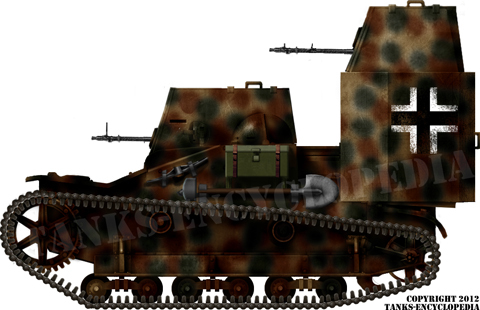 Kleiner Funk-und Beobachtungspanzer auf Infanterie-Schlepper UE(f), one of the fifty modified by the Beck-Baukommando as command vehicles, later affected to the (new) 21st Panzer Division. France, Normandy, June 1944. None of these UEs were ever registered in African units. Italian Renault UE, Sicily, July 1943. The Germans sent about 64 UEs Chenillettes at the end of 1943. Most were kept in Italy and many based in Sicily as infantry ammunition suppliers when Operation Husky began in July 1943. Some were captured and served with US infantry for some time during the campaign. 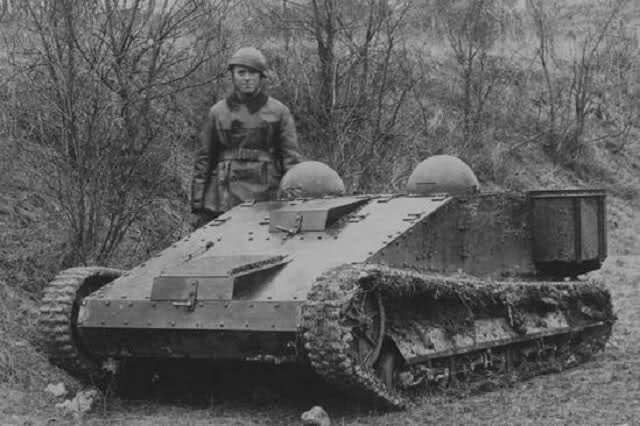 There is no known photo of a US captured Renault UE tankette or in Italian service. This illustration is purely the illustrator’s recreation. Sicherungsfahrzeug UE(f) from the regular security patrols of Luftwaffe airfields in recently taken or hostile territories, or bases against resistance and partisan raids. Others UEs were used as aircraft and bomb tractors. 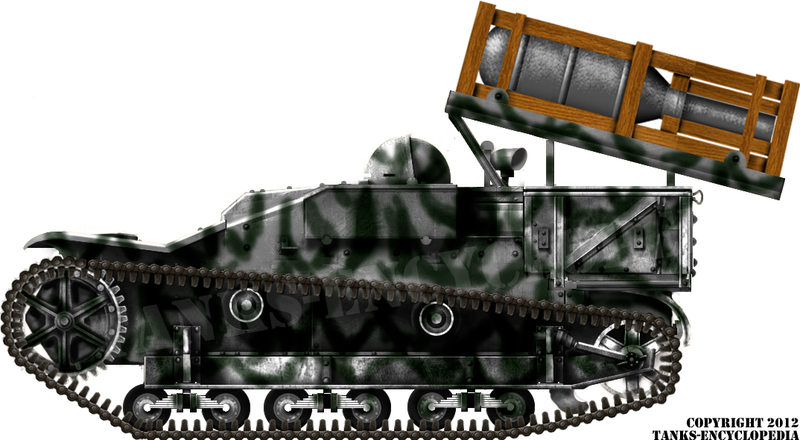 Selbstfahrlafette für 28/32 cm Wurfrahmen auf Infanterie-Schlepper UE(f) (heavy rocket launcher), early version, with frames on the sides, welded to the main body. They supported wooden launchers for the heavy 280 mm (11 in) rocket for infantry support. Russia, Kursk, August 1943. Late Selbstfahrlafette für 28/32 cm Wurfrahmen auf Infanterie-Schlepper UE(f). Around fifty conversions as rockets launchers were performed over the UE basis, including an unknown quantity of late conversions with a four stack ramp mounted over the bin. Belgium, December 1944. Look at the rear track drive wheel and road wheels. They are different from the normal arrangement on a standard Renault UE. This is a prototype fitted with Kégresse track and suspension system. It differs from conventional track systems by using a flexible belt rather than interlocking metal segments. 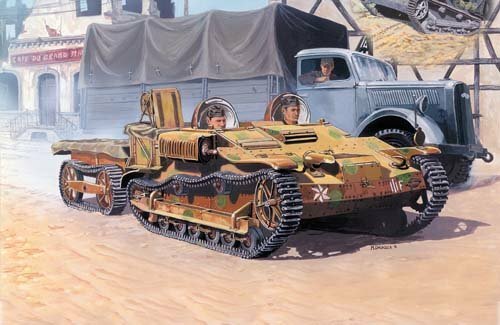 was their ever a attempt too mount a 57mm 6 pounder gun on the vehicle, similiar too the Selbstfahrlafette für 3.7 cm Pak 36 auf Renault UE(f) second version? don’t know, but the German variant is about as close as we all can get to a real-life UE-57, people. The UE-57 was real. But only a single proto was built by free french forces in the UK in 1943. 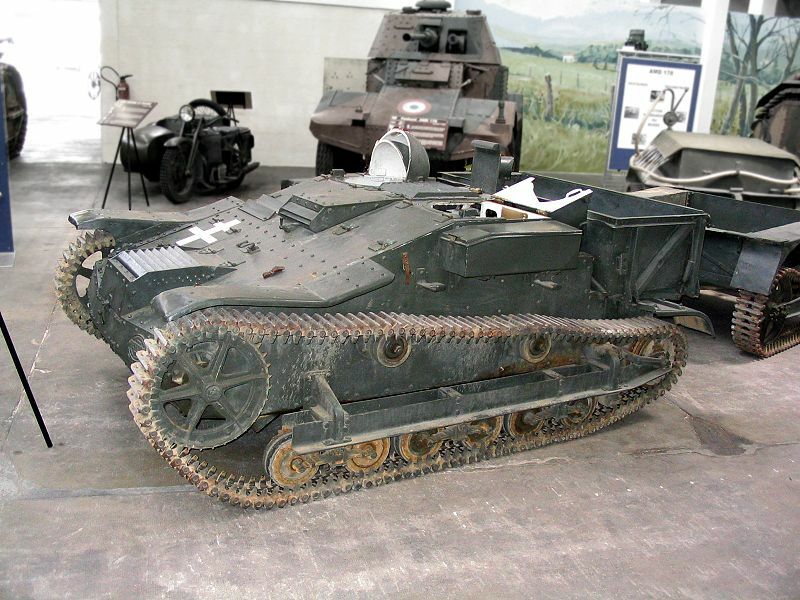 Some sources suggest there may indeed have been a single prototype based on a UE tractor fitted with a British 6-pounder anti-tank gun, but trials of this new UE variant apparently didn’t work out so well and so the project was soon abandoned, with the gun subsequently being removed from the vehicle. Does anyone have the engine bay and transmission compartment sizes?